Manjushrimitra (Tib. Jampal Shenyen) was born to a Brahman family just outside of Bodhgaya, India. When he was still a child, he had a pure vision of Manjushri, in which he was told that if he wanted to attain Buddhahood in this very lifetime, he should seek out the Shitavana charnel ground. 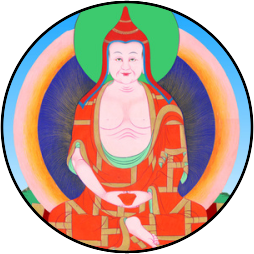 He followed the advice without question and after arriving there, met Garab Dorje from whom he received empowerments and teachings. He remained there, mastering all of the tantras, explanatry commentaries and pith instructions for seventy-five years. After he had finished listening to the teachings, Garab Dorje dissolved into a mass of light at the source of the Dantik River. After Manjushrimitra cried out in distress and devotion, a jeweled locket the size of a fingernail fell from the mass of light, containing Garab Dorje's last words, The Three Words that Strike the Vital Points. After merely glancing at it, Manjushrimitra's realization became equal to his master's. Manjushrimitra divided the 6,400,000 verses of the Dzogchen Tantras into three categories: the Category of Mind (the abiding state), the Category of Expanse (the state free of anything to be done), and the Category of Upadesha (the significance of key points). He also divided the Nyingthig, or heart essence, teachings into two sections: the explanatory tantras and the tantras transmitted orally. Not finding a suitable student to receive the explanatory tantras, he concealed them as termas in a boulder marked with crossed vajras northeast of Bodhgaya. He dwelled in the charnel ground of Sosadvipa for 109 years. He later transmitted the teachings on the Secret Mantrayana to his disciple Shri Singha.